The food and drink industry is a demanding environment. Therefore, drink and food manufacturing flooring needs to be anti-slip, hardwearing, and hygienic. Additionally, it also needs to be resistant to product spillage and temperature variations. How to choose the right type of drink and food manufacturing flooring? 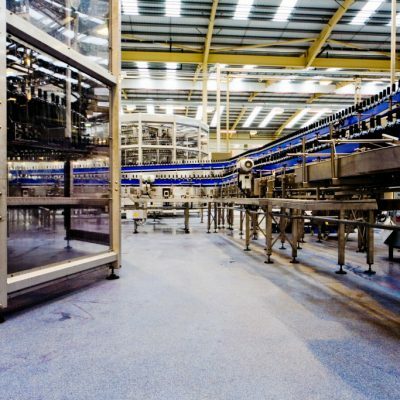 It is vital to make the right decision when choosing a drink and food manufacturing flooring and installation programme. However, we can only determine product’s suitability, once we have evaluated our customer’s requirements. The food and beverage industry incorporates a varying array of products and processes, which will determine what floor characteristics are required. Exceptional resistance to physical and chemical attack. Our flexible working approach means that we can compete installations within extremely short timeframes. We understand that many food and drink manufacturers work around the clock. Therefore, we will work with you to select a suitable product and working programme that will have minimal disruption on your production and operating processes. We can provide a complete package for all your flooring requirements. Our offering includes concrete repair, underlay screeds and drainage solutions as well as finished resin floor. Our turnkey solutions can help to eliminate the contamination of water or food products to provide a more hygienic and safer floor. As part of our service we now offer an on-site slip testing facility to highlight your floor’s performance to show if and how it can be improved. Through experience and certified results, we provide our customers with all the necessary information to make an informed choice. We can also provide products suitable for reception and changing areas as an alternative to vinyl and tiled solutions. “Long Clawson Dairy have utilised the services of National Flooring since 2010. They have worked on numerous projects over the years ranging from the patch repair of floor screeds, installation of new floor screed, coving and screeding of kerbing in High Care & low Risk production areas, and also setting falls in changing rooms and equipment washrooms. We found them to be very flexible and accommodating with working hours, fitting in with production requirements as necessary.